I am sold! And I'm disappointed that this exceptional pilsner doesn't have a higher ranking compared to the other sub-par offerings on this list. Unlike some of its regional cousins (who shall remain nameless), this pilsner could actually pass for a German import. Its light, crisp flavor stand in stark contrast to the proliferation of over-hopped or sickly-sweet pilsners that other regional craft breweries have produced. All too often these days, craft breweries throw "imperial" or "double" on the end of a beer style, in order to cover their defects with alcohol. But not this beer. Six Point has crafted a relatively modest (in alcohol content) session pilsner that's exceptionally quaffable and deserves a higher ranking among the "big" craft breweries and their mediocre lager offerings. appearance; color is a very clear, pale gold. pours a finger of white head that quickly settles into spotted lacing. a slow, steady stream of bubbles constantly rise to the surface of the beer. smell; very clean. smooth yeast, kick of floral hops. mouthfeel; very crisp, light body,medium carbonation. very slight amount of dryness before leaving quite a juicy feel in the mouth. overall; the perfect american pilsner. Can with a best before date of May 2015 (drinking in July 2014). Beer has a typical pilsner head. Beer has a wonderful aroma of hops. Strange because they actually smell more like American IPA hops vs. the usual European Noble variety. The taste is excellent for a pilsner. Very hop forward with maltiness balance. A little over hopped perhaps but a tad more balanced than say, Prima. Overall I thought this was one of the better pilsners out there and a high quality brew from SixPoint. Best by May 9, 2015. 12oz can poured into a pint glass. This was a gusher, but didn't affect the experience. Pours a pale yellow with a small white head that leaves nice retention and solid lacing. The aromas are full of sweet pilsener malts. Lots of citrus notes. I will say there is a nice hop presence in the aromas and flavors. Some pear in the mix as well. The flavors are great. There's definitely a hop bite to this one, but still remains true to the style. Maybe some black pepper in the mix as well, but it's really not spicy. It's extremely clean and refreshing. The mouthfeel is very nice. It's light with a solid body to it. The carbonation is active and it's very smooth. This is an extremely drinkable brew. It's perfect for the warm weather, but will hit the spot during any season. I'm pretty much blown away. This is definitely my favorite beer I've had from Sixpoint. I'm disappointed that it took me so long to try this. Awesome stuff. Highly recommended. Pilsner glass pour: Golden yellow with a slim white head, decent lacing. Looks refreshing. Smells more of some fruity hops. Cherry/ white grape, floral, bread in the background. Not what I expected. Fantastic. Unique nose for a pilsner. Tastes like a refreshing pilsner with nicely bitter fruity hops, hint of orange: honey sweetness, peppery. Complex. An exceptional German style pilsner that lives well up to its name. One of the best pilseners and one of the best beers I've ever had hands down> These cats can brew. 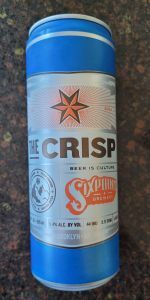 Another excellent try from Sixpoint. Pours ultra smoothly from the 16 oz. can to perfectly fill a pint-size glass. Light, golden and slightly pale colors with some nice bubbles. Lacing remains on the surface after pour. Smell is quite exceptional. Grassy & slightly fruity hops with a sweet toasted banana bread malt. Taste is the snappy, crisp hops in a pilsener style, detected some saaz type hops there, a hint of hop oils and or resin (not too much), with a nice sweetly balanced malt body. A very light & pleasant bitterness/sharpness left behind. Very sharp and clean, excellent carbonization, clean and refreshing. A delicious, highly drinkable beer in the Pilsener style. One of the few American Pilseners that adds it own unique character to the style but keeps it right in the pocket its known for. Appearance: A touch darker than your adjunct pilsner, it's crowned by a fairly fluffy head. Good head retention. Smell: Hops, some biscuit malt, and a little bit of skunkiness that you're going to expect from a German-style pilsner. Taste: Fresh, ultra-dry hops and a touch of malt. This isn't my favorite style by any means, but this beer tastes refreshing with its floral flavors. Mouthfeel: Near perfect, the beer truly is crisp without being overcarbonated. It's sessionable despite being flavorful. Overall: Absolutely the best pilsner I've had and likely to please the IPA fans who are normally wary of malty lagers or pilsners. Bight golden, lively, with a creamy white foam head. Nose is very delicate with soft bready malt and floral hop aromas, and a hint of hard-boiled egg. Prickly carbonation up front. And, like its name suggests, this is one crisp--"very crisp"--beer. Nice bite of herbal and pith, with a quick snap of dry bitterness, and suggestions of mint and green wood. It eventually yields to a smooth, but firm, body. Malt character is expectedly light. Touch of honey and a complementary biscuity note that pairs well with the beer's crispness, and adds more depth to the overall dryness of the beer. Very quenching, more-ish and insanely drinkable. One of our favorite Sixpoint offerings to date. Tastes like a fresh import. Zwei Maß Crisp, bitte! 16oz tall boy w/ a best before date on the bottom. Poured half into the glass for look and smell. LOOK: Mildly hazed golden glow when put up to the light, thin but very sturdy lacing. In the fast paced craft beer movement lagers have been trying to catch up, Crisp is proof that things are turning around and gives a better view of what a modern lager can be ... taking from old while brewing from new minds. the only minor blemish is i thought the mouthfeel was just a little bit flat or weak but i am really nit picking at this point, it really was super fresh and refreshing hey you might even say it was "crisp"
Weekend pilsner kick. Picked up some of these cans at Bellport. Nice price too. Poured with huge white big head. Sat right on top. Pure white. Color was deep yellow almost copper but not quite. Strong meadow aroma almost floral and maybe even a bit spicy. Great flavor. So balanced between sweet and bitter. Ultra clean. A real great super drinkable beer. Almost dangerous. The hops are the only thing holding you back. But at the same time they beg you forward. I will definitely be buying lots of this. Drank several of these with friends in the backyard of Roberta's. Had a blast! My first beer was right out of the can. The next one I poured into a glass. What a massive pillow of a head! Great pure white foam like snow on top of a golden molten liquid. Beautiful! I drank this so fast it was so delicious. The aroma smelled like fresh grass. It was so good. The taste followed up with a sweet undertone and a big bold hop presence underneath. It was so unique almost like an IPA but very clean too! Mouthfeel was nice. Real light almost subtle snap to it. Overall an excellent beer. I hope I can find these for sale in CT. It was delicious! Appearance: orange hazy with 1 finger head. Smell: Belgian ale esque, hoppy, lemon, seltzer. Taste: Thick, lemony, cracker like, grassy hops, clean finish. Mouthfeel: quite effervescent and very silky. It was a good pilsner and definitely one of the better ones I have had. Would definitely drink this again. Appearance: Clear but very golden with a bright and lightly frothy white head. Upon thining out some good lacing is left behind. Aroma: Biscuity, light grain, pear, the citrus notes are spot on. Light bready malts with a twinge of dryness in the nose. Taste: Very crisp mouthfeel that has a great citrus bite and even a dam good dry finish. Notes of pear, biscuit, grapefruit, piney, wisps of bready grain. In the back there is a little bit of a buttery texture that tops it off. Notes: Dam this German Pilsner is tasty in other words it's freaking remarkable. The dry finish is incredibly spot on. Oh yeah and one other thing I wanted to mention it's a Lager oh hell yeah. Cheers. Bought a sixer of this a couple days ago, and have really enjoyed it! The name gets it right - it is very crisp, with a citrusy grapefruit aroma on the pour. The head is full, but dissipates quickly. On the first sip the grapefruit taste comes thru, with some mild bitterness that ends in a clean finish. All in all, deeelicious! Look- Straw yellow. Mostly clear but with a slight haze unlike other pilsners. Smell- Perhaps my favorite thing about this beer. Citric aroma, reminds me of grapefruit, also elements of hops. Taste- As with the aroma, a citrus, grapefruit like taste with a very pleasant bitterness coming from the hops. It seems to have a higher hop presence than other pilsners. Feel- Medium carbonation. As the name suggests, crisp, clean and refreshing. Overall- What a delightful pilsner! Simply one of the best American pilsners on the market from one of my favorite breweries. lemongrass and spice in the nose. A hint of lime. Somewhat farmhouse smell. taste is grassy with the hint of lime picked up in the nose. A touch of bitterness and rounded out with a bit of a sweet green tea taste. A bit of American citrusy hops become somewhat apparent halfway thru. Light bodied as expected with moderate to high carbonation. Crisp, dry, and really clean finish. Kind of new to this style but I really like this one. Works great in these hot humid summer days. a lot of flavor packed in to this beer but maintains a light refreshing body. Well done once again by the boys from Sixpoint. Seek this one out! Ok so I got a sixer at a bottle shop and saw the BB date was Sep 15 and also got a fresh sixer from a friend with a BB APR 2016. The fresher beer was fantastic in fact one of the best Pils I have had. The older beer was ok but you could tell not fresh had kinda earthy taste. Good job Sixpoint! I have updated my review due to inconsistent quality. Sometimes great, sometimes mediocre. Appearance: Nice and bright golden color with a soft head. Looks like your standard pils, but nice depth to the color. Smell: Grassy hops with a touch of citrusy lemongrass. Standard lager breadiness. Taste: Holy crap, one of the best US made German Pilseners hand down. Really nice bready, biscuity lager notes which are complimented by an assertive herbal/citrus hoppiness. A bit hoppier than continental versions, but very well done. Finishes semi-dry. Extremely impressed. Mouthfeel: Light with high carbonation makes this one easy to put back. Does not feel thin, even as it warms and looses some carbonation. Overall: One of the best US-produced German pilseners available. If you're a lager head, you've got to try this one. Can't say much about how it looks because I drink this one right from the can. It comes in a box of six which works out well as I've never wanted to drink fewer than six at a time. This is a beer for sitting outdoors in the sun and cultivating skin cancer.